Prepare the skin for adhesives or re-energise "used" double sided tapes. My View: "The first time I used these wipes I really could not believe it. They make "used" double sided tapes become incredibly sticky again. A great way to get more use out of your tapes." Just rub one of these wipes on a "used" double sided tape and it will become sticky enough to use again. 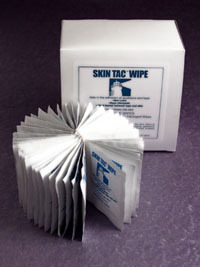 I use skin tac wipes for my diabetic inulin pump. They work very well.